Several weeks ago, I wrote about having been taken in by an IQ test scam on Facebook. Lots of other people have also written about that and other scams. Somehow I naively thought that once Facebook realized it was enabling deception on its service, it would get rid of the scams. But if anything, the scams have become more plentiful — and more disgraceful. The image above is a screen shot, captured today, with my annotations in red. It’s an ad — but if Facebook permits advertisers to use Facebook blue and otherwise mimic Facebook’s look and feel, it thereby lends Facebook’s credibility to the ad. So when the text falsely says “3 of your friends have challenged you to beat their IQ scores,” Facebook is lying to me. If I enter my cell phone number — as I was foolish enough to do before — I expect it will then give me a code and ask me to send it as a text on my cell phone. Doing so will constitute a confirmation that I agree to their terms of service. The barely readable diagonal blue text at right says “$9.99 Monthly Subscription.” The barely readable “Terms” link leads to a page with more than 9,000 words of dense legalese. Somewhere therein it says that using the “service” constitutes agreeing with the terms. Way at the bottom, it states that the terms are $9.99 a month. It’s a standard Windows popup message, the text at top and bottom is generated by Windows. The only customization is the text in the middle — which tries to keep you on the site by telling you that “Cancel” means the opposite of what it says on the line below. Once you’ve “agreed” to the terms for one of these scams, you can get out of the charges by spending half an hour or so in voicemail hell with your phone company. But how many teens and tweens have incurred the charges without realizing it, or without having the courage to tell Mom or Dad that there may be a problem on the cell phone account? The fact that there are competing scams says to me that it’s a business model that works for the scammers. Facebook didn’t actually create these scummy scams. It just knowingly profits by driving its 200 million members to them. That is to say, it profits in the short run. In the long run, it’s hard to believe that it is truly in Facebook’s best interest to participate in victimizing its members. This entry was posted in Uncategorized and tagged Facebook, Social Media by Kirk Petersen. Bookmark the permalink. Gracious, Kirk. This is well-done. My first response when I saw that my wife had supposedly challenged me to an IQ test was to ask her, since she was sitting on the couch next to me. But that option isn’t always there. Thanks for sharing – I remember this from another post. I am not a big user of Facebook – for one, it is not dial-up friendly, and second, I don’t care to much to publish to the world what I am doing or what I am working on. This always ticked me off about FB and I have now learnt to completely ignore everything on there except the stuff on my wall and messages in my inbox that actually come from a named person on my friends list. Thanks guys, for the comments and the kind words. Ok, how do I op out of this?? I went to Verizon and they said I have to go to the original website and find the opt out area? Verizon can not block any of their texting unless I cancel my “subscription”. What are the steps to get out of this!! Glad it worked out, Jodie. I suggest checking your next Verizon bill to make sure you didn’t get charged. If you did, go back to Verizon, demand they reverse the charge, and tell them they should check their customer support records because you have complained about this before. I opened this little message but have not texted anyone yet and ihavent given them my number. does anyone know how to get it off my screen.? Of course when i x out it does go away. The Verizon rep I spoke with had the directions to text stop to the offending scammers and she actually stayed on the phone with me while I did so. It was 2 different stop texts to 2 different numbers. She then put a freeze on premium messaging for my account. If I ever do want to get a ringtone from a legit service I will have to call and unfreeze, order, refreeze. Kirk, why do you think Verizon would cancel the already incurred charges? After all you (and I) did accept the terms of agreement. It’s like pleading your case when stopped for speeding that you did not know the speed limit. Not their problem. Al, that’s a VERY good question. To put a finer point on it, if they recognize that it’s appropriate to waive the charges on a scam, why do they permit the scam in the first place? Agreed Kirk. I took a look at the “stop” texts and they were to “solow” and “sendme”. I took a look and these look like real services and I saw at least one reference to needing a 9.99 package for some ringtones. My beef is with Facebook, not Verizon. 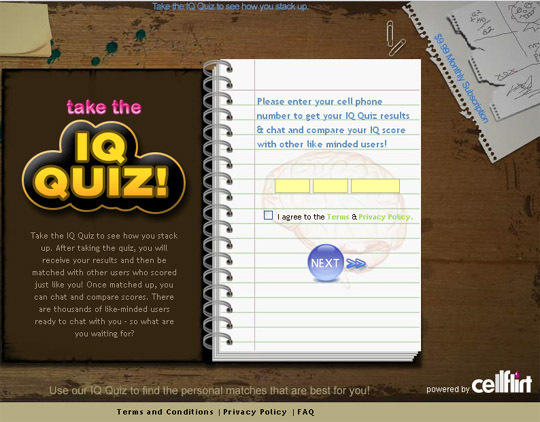 Facebook is where I was conned into thinking I was taking an IQ test when I was actually ordering a ringtone package. I think Facebook and Verizon are both to blame. I just went through this with Verizon when I noticed my daughter's line has been hit for 9.99/month from Solow.com since May (6 months). Along with a couple other similarly sketch charges, about $100 in all. Verizon agreed to credit half of it. Since we'd been stupid enough to pay it for several months, I didn't think I could complain more than that. (we have five lines, data, texting and the odd *legitimate* premium svc., navigation, etc. depending upon the month, so actually not that surprising that we missed $10 or $20 buried on one of the lines in any given month. I only caught it by chance reviewing my bill online when changing out a phone today.) TAKE ADVANTAGE OF THE BLOCKING OPTIONS ON YOUR LINES! Its scary that people sign up for these scam programs. 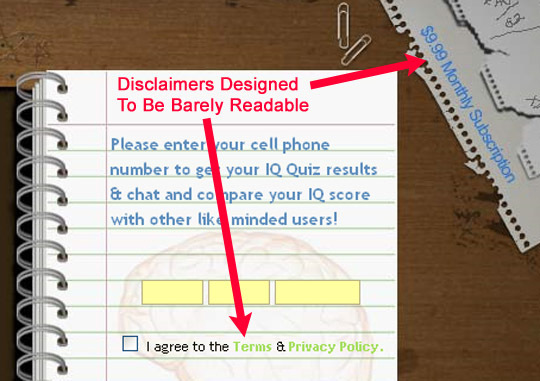 You have to be a little dumb if you sign up for a $9.95 per month mobile billing service to get the results of your 5 question IQ test. Facebook STILL has this! I was a little slow to find out about this since I would never want the text message. I must have been feeling insane or did it in my sleep (LOL) this time. I noticed how high my bill was and fortunately called. I wasn’t offered a refund by Verizon, but they did block the Premium messaging and also gave me the codes to text STOP to so I can get rid of them again. I can’t believe it hasn’t gotten around more that this is an application you’re paying for, not just a simple text msg. I got this site from my pal who informed me about this site and now this time I am browsing this site and reading very informative posts at this time.